Video delivery via the web used to be extremely difficult and problematic to achieve. It was an issue due to typical video size and the bandwidth that end users were likely to have as well as the demand on the bandwidth of your web host. Not only this, but it was also an issue simply delivering the video itself – there were not too many reliable delivery methods for web-based video streaming and this became especially apparent when you were trying to cater for videos procured and compiled from many different sources and also when you were trying to ensure compatibility across many different browser platforms and physical devices. The development of the HTML5 mark-up language has revolutionised this video delivery via the web. Not only has HTML5 developed a native video delivery method, it has also been taken up quickly by a large majority of web browsers and webmasters alike meaning that a standardised method for video delivery on the web is being formed, with its centre being HTML5. HTML5 is fantastic for video because although the take-up was initially slow, it is now supported out of the box via the vast majority of internet browsers. In addition, HTML5 contains lots of other cool features that enable you to manipulate your videos in order to enhance the experience you are providing to your end users. 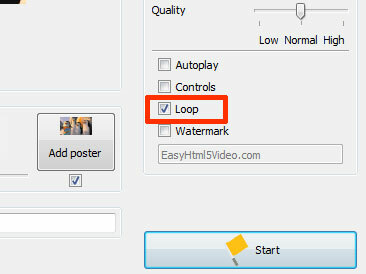 One cool feature is the HTML5 video loop attribute which enables video to play continuously – starting again once it reaches the end of the loop. EasyHTML5Video is a great tool for generating a html5 video loop for videos and enables you to quickly and efficiently deploy HTML5 video on loop to your website users.